So wicked hot here this summer that the garden really never did take off proper. I am so grateful to have even just a few dozen heirloom tomatoes and this chopped tomato medley is perfect for some crusty toasted ciabatta. 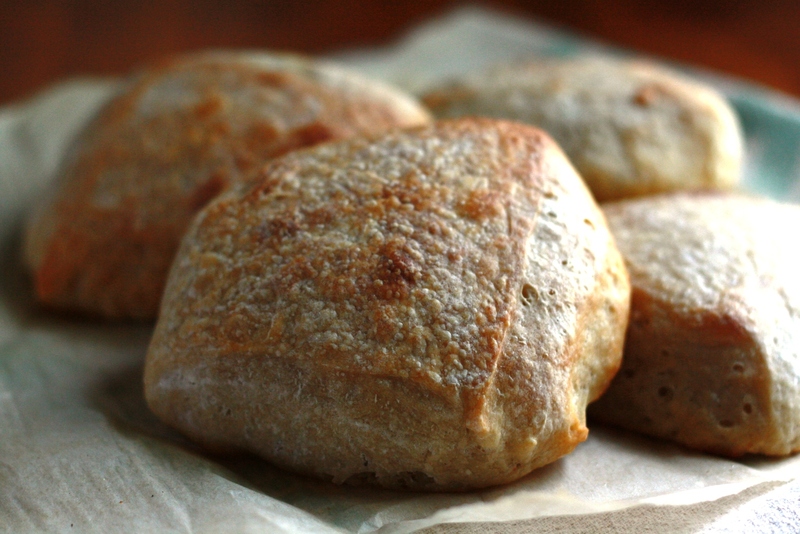 I usually prepare a large amount of sourdough ciabatta dough and keep it in the fridge. Since there is just the two of us now, I do not need to bake giant loves of anything any more unless I am bringing it to a family gathering. Having the dough at the ready is so handy! This week we had a small sourdough focaccia and pizza, all made from the same wonderful dough. This morning I took the last of what was in there and shaped 4 rolls for tonight's supper. Baked them off early before the temps got all crazy on me. Either sloppy joe's or a grilled burger will fill the bun, along with some sweet potato fries and a side of sauerkraut. Eew! Chicken feet for stock! A couple of weeks ago we finally made it down to the Fulton Street Farmers Market and I was fortunate to be able to find some chicken feet and heads at one of my favorite stalls. I have been out of my homemade stock for a while and needed to replenish my supply. We bought 5 packages and tossed them in a pot along with some chicken backs I had previously frozen, a few veggies, and simmered for 24 hours. Strained it all and ended with 9 luscious quarts of golden chicken stock. Are you ready for cooler temps? Looking so forward to simmering soups and casseroles on the menu once again. I'm glad to see you posting! I hope that you have mended your computer or gotten another one. The bruschetta topping looks positively delicious. YUM! And homemade rolls, you better hold me back, LOL! The chicken feet grossed me out though! Got to be honest here - hahaha!!!!! I am SOOOOO ready for cooler temperatures! Cindy, I love how pretty and colorful your blog is. would love to know if you designed it or who did. Would also love your sour dough recipe!! I'd like to keep some in my frig too. While there is no "two" of us just "one" of us, occasionally someone comes by and it would be so cool to do some fresh rolls or something with real butter to "entertain" them with. And oh my SOOO looking for cooler weather. As you can see in my blog I've been doing a LOT of "porching" (sitting on the porch and watching whatever goes by and whatever happens!) Cooler weather will make that just fabulous. There is a TINY cold front coming by this weekend. Weather in the 80s, I'll take it! Cindy, just sent you an order. Please see my note to you regarding your "citrus salt". it looks fabulous. Your recipes always look so delicious and I still enjoy making your easy-peasy crockpot yogurt! 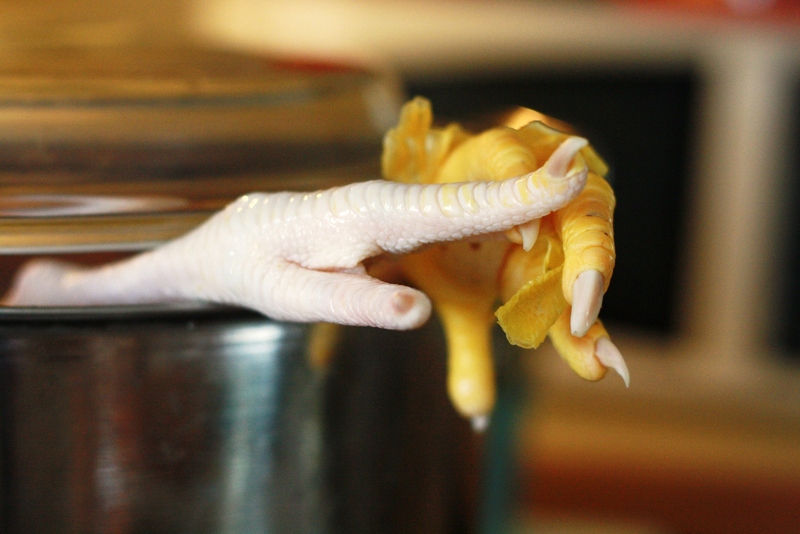 I haven't used chicken feet to make stock yet, but many years ago I actually ATE chicken feet at a Chinese restaurant! I think that I was more adventurous back then ;-). I'm looking forward to fall, too. Like you, I love to make soups and stews in the cooler weather. May the Lord bless you today ~smile~. Cyn~ What kind of bread dough do you make and use? Love that you just can take what you need for that meal! I use Peter Reinhard's book, "artisan breads every day", and usually make the Pain a l'Ancienne Rustic Bread on pg 52, swapping out all the yeast for a generous cup of sourdough. I got my starter from a friend who got hers from Cultures in Health. It is the Ischia starter, named after a tiny island off the coast of Italy. It makes the best sourdough bread ever. I used to use my homemade starter, which was just so-so. This is unbelievable! Because it has not been too hot here, I have made stock throughout the summer...funny, hey? :) Don't you just *love* that golden goodness??? 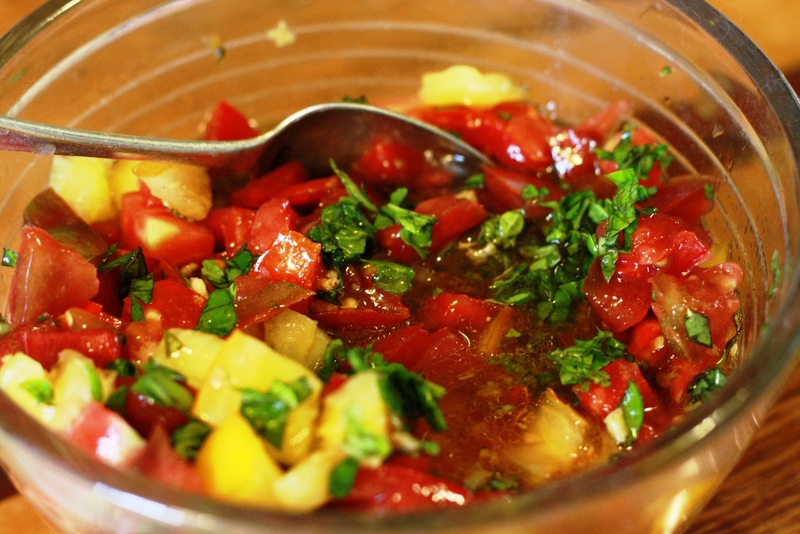 Your bruschetta topping looks super duper yummy nummy! I will be on the look out for this book. It all looks wonderful! Except the chicken toes. Sorry. I was served them a lot when I lived in China. But I bet they make wonderful stock! !